When An Alien Says It’s Party Time… – How Would You Do It? “Nope, sorry. The research in Dome 5 shall not be disturbed by order of the Grand Poobah, nothing in central admin, otherwise looks okay.” She cut the comm. “Mort, I will donate my lunch money every day if I can get our satellite link-up fixed for Christmas.” Kathy reiterated the common grad student complaint, knowing full well Mort lobbied for it monthly. A new sat was promised on the last bus, but of course nothing came of that. After checking the first nearby box, Tape led them to a buggy and they all climbed in. He took the long way around to avoid the area around the proscribed Dome 5, though he knew the tree-people retired at night and wouldn’t be noticeable. “We didn’t get up until afternoon and gotta get it done,” she replied. “There are over 400 seismometers and we’re one of four teams checking them. Stop here!” She jumped out with Mort and they trotted to the fence. He went one way and she the other with their case keys at the ready. Case open, scan data, case close and lock. They stopped eight more times checking two multiple-instrument stations at a time until they neared the last dome of the big circle. Inside they saw a vast field of soybeans and one tree. Tape hit the switch that turned on every third light. Mort and Kathy jumped back to Tape who stood stock still, glued in place from consternation. Tape knew there were alien things in Dome 5, but this one had escaped. He trotted back to the entry and switched on the rest of the lights. He looked around the rest of the dome once more to verify there were no other ‘trees’. Mort waved and moved up with Kathy. He gulped. “No reason at all.” Pleased she knew his name, he smiled and decided to stay put. A vestibule door banged open, making all the humans jump and gawk at the old man racing in from 30 or 40 meters away. “Aalen, names Kathy and Mort,” LeeLaa piped. “Grand to meet you and your other guest,” she said jokingly, “things have changed!” She whipped around as the vestibule door banged open again, hanging on to Alain’s hand and pulling him so briskly he fell onto her. They righted themselves as LeeLaa whizzed by to embrace the newest arrival. Tape saw another guy come in from the vestibule behind Elise. She outpaced the man because he caught sight of the point-blank alien and skidded to a stop, statue-like, maybe striving to blend into the bushy greenery in his white suit, staring at LeeLaa who called, “Martaa!” Tape judged that although it looked like the girl he knew as Elise was being engulfed by tentacles, she seemed to be enjoying it. Curiouser and curiouser. Alain pinched at his forehead and went over to pat the still gaping Ricky on the shoulder. He slid his hand down to Ricky’s arm and tugged him around the stars of the show to where Mort and Kathy stood close to each other. 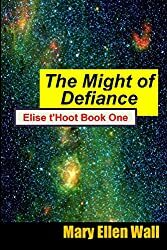 An excerpt from An Uncivil War, the Lastest and Greatst Sci-Fi novel with Elise and the tree-like aliens. Launching this month – watch for it!